The integral fast reactor (IFR, originally advanced liquid-metal reactor) is a design for a nuclear reactor using fast neutrons and no neutron moderator (a "fast" reactor). IFR would breed more fuel and is distinguished by a nuclear fuel cycle that uses reprocessing via electrorefining at the reactor site. The IFR is cooled by liquid sodium or lead[dubious – discuss] and fueled by an alloy of uranium and plutonium. The fuel is contained in steel cladding with liquid sodium filling in the space between the fuel and the cladding. A void above the fuel allows helium and radioactive xenon to be collected safely without significantly increasing pressure inside the fuel element, and also allows the fuel to expand without breaching the cladding, making metal rather than oxide fuel practical. Breeder reactors (such as the IFR) could in principle extract almost all of the energy contained in uranium or thorium, decreasing fuel requirements by nearly two orders of magnitude compared to traditional once-through reactors, which extract less than 0.65% of the energy in mined uranium, and less than 5% of the enriched uranium with which they are fueled. This could greatly dampen concern about fuel supply or energy used in mining. Fast reactors can "burn" long lasting nuclear transuranic waste (TRU) waste components (actinides: reactor-grade plutonium and minor actinides), turning liabilities into assets. Another major waste component, fission products (FP), would stabilize at a lower level of radioactivity than the original natural uranium ore it was attained from in two to four centuries, rather than tens of thousands of years. [unreliable source? ][better source needed] The fact that 4th generation reactors are being designed to use the waste from 3rd generation plants could change the nuclear story fundamentally—potentially making the combination of 3rd and 4th generation plants a more attractive energy option than 3rd generation by itself would have been, both from the perspective of waste management and energy security. The available fuel metals were never separated from the plutonium isotopes nor from all the fission products,[better source needed] and therefore relatively difficult to use in nuclear weapons. Also, plutonium never had to leave the site, and thus was far less open to unauthorized diversion. 2 emissions by 2050 of the presently under construction Generation III reactors, it did summarize the Life Cycle Assessment findings of in development reactor technologies. Unlike PUREX reprocessing, the IFR's electrolytic reprocessing of spent fuel did not separate out pure plutonium, and left it mixed with minor actinides and some rare earth fission products which make the theoretical ability to make a bomb directly out of it considerably dubious. [better source needed] Rather than being transported from a large centralized reprocessing plant to reactors at other locations, as is common now in France, from La Hague to its dispersed nuclear fleet of LWRs, the IFR pyroprocessed fuel would be much more resistant to unauthorized diversion. 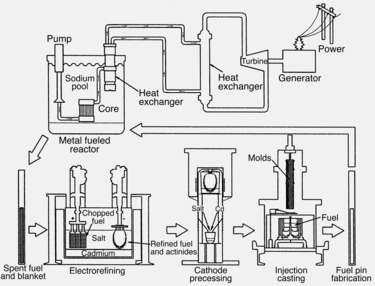 [better source needed] The material with the mix of plutonium isotopes in an IFR would stay at the reactor site and then be burnt up practically in-situ,[better source needed] alternatively, if operated as a breeder reactor, some of the pyroprocessed fuel could be consumed by the same or other reactors located elsewhere. 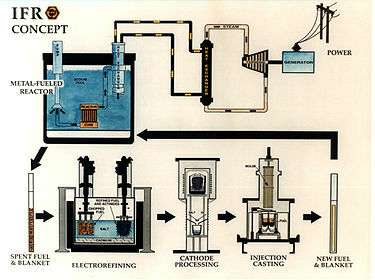 However, as is the case with conventional aqueous reprocessing, it would remain possible to chemically extract all the plutonium isotopes from the pyroprocessed/recycled fuel and would be much easier to do so from the recycled product than from the original spent fuel, although compared to other conventional recycled nuclear fuel, MOX, it would be more difficult, as the IFR recycled fuel contains more fission products than MOX and due to its higher burnup, more proliferation resistant Pu-240 than MOX. Argonne previously had a branch campus named "Argonne West" in Idaho Falls, Idaho that is now part of the Idaho National Laboratory. In the past, at the branch campus, physicists from Argonne had built what was known as the Experimental Breeder Reactor II (EBR II). In the meantime, physicists at Argonne had designed the IFR concept, and it was decided that the EBR II would be converted to an IFR. Charles Till, a Canadian physicist from Argonne, was the head of the IFR project, and Yoon Chang was the deputy head. Till was positioned in Idaho, while Chang was in Illinois. Despite support for the reactor by then-Rep. Richard Durbin (D-IL) and U.S. 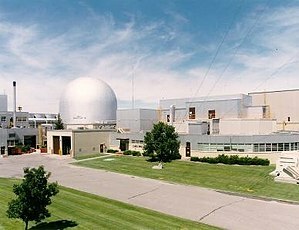 Senators Carol Moseley Braun (D-IL) and Paul Simon (D-IL), funding for the reactor was slashed, and it was ultimately canceled in 1994 by S.Amdt. 2127 to H.R. 4506, at greater cost than finishing it. When this was brought to President Clinton's attention, he said "I know; it's a symbol." By this time Senator Kerry and the majority of democrats had switched to supporting the continuation of the program. The final count was to 52 to 46 to terminate the program, with 36 republicans and 16 democrats voting for its termination, while just 8 republicans and 38 democrats voted for its continuation. ^ "GE Hitachi Nuclear Energy Encourages Congress to Support Development of Recycling Technology to Turn Used Nuclear Fuel into an Asset - GE Energy press release". Genewscenter.com. 2009-06-18. Archived from the original on 2013-12-03. Retrieved 2014-01-24. ^ a b c "Roger Blomquist of ANL (Argonne National Lab) on IFR (Integral Fast Reactor) @ TEAC6 . Stated at ~ 19-21 minutes". ^ a b c d e "An Introduction to Argonne National Laboratory's INTEGRAL FAST REACTOR (IFR) PROGRAM". 2007-10-09. Archived from the original on September 15, 2008. Retrieved 2014-01-24. ^ a b c "Roger Blomquist of ANL (Argonne National Lab) on IFR (Integral Fast Reactor) @ TEAC6 . Stated at ~ 13 minutes". ^ "Passively safe reactors rely on nature to keep them cool". Ne.anl.gov. 2013-12-13. Retrieved 2014-01-24. ^ a b c "Roger Blomquist of ANL (Argonne National Lab) on IFR (Integral Fast Reactor) @ TEAC6 . Stated at ~ 17:30". ^ a b Janne Wallenius (2007-04-01). "Återanvändning av lång sluten bränslecykel möj" (PDF). Nucleus: 15. Archived from the original (PDF) on 2014-05-19. ^ Estimates from Argonne National Laboratory place the output of waste of a 1000 MWe plant operating at 70% capacity at 1700 pounds/year. ^ Radioactivity and its associated dangers are roughly divided by an isotope's half-life. For example, Technetium-99's 213,000 year half-life combines with the IFR's 1/20 volume reduction to produce about 1/4,000,000 of the radiotoxicity of light water reactor waste. The small size (about 1.5 tonnes per gigawatt-year) permits expensive disposal methods such as insoluble synthetic rock. The hazards are far less than those from fossil fuel wastes or dam failures. ^ Till and Chang, Charles E. and Yoon Il (2011). Plentiful Energy: The Story of the Integral Fast Reactor. CreateSpace. pp. 157–158. ISBN 978-1466384606. Archived from the original on 2011-06-05. Retrieved 2011-06-23. ^ http://info.ornl.gov/sites/publications/Files/Pub37993.pdf Categorization of Used Nuclear Fuel Inventory in Support of a Comprehensive National Nuclear Fuel Cycle Strategy. page 35 figure 21. Discharge isotopic composition of a pressurized water reactor fuel assembly with initial U-235 enrichment of 4.5 wt % that has accumulated 45 GWd/MTU burnup. 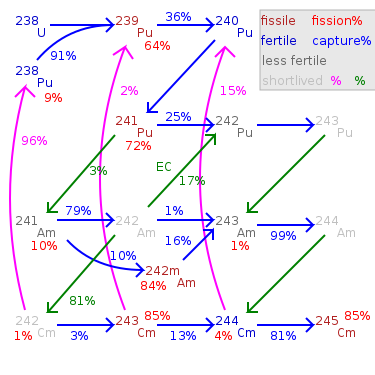 Isotopic composition of used nuclear fuel as a function of burnup for a generic PWR fuel assembly. ^ WNA contributors (March 2009). "Plutonium". World Nuclear Association. Retrieved 2010-02-28. ^ Poplavskii, V. M.; Chebeskov, A. N.; Matveev, V. I. (2004-06-01). "BN-800 as a New Stage in the Development of Fast Sodium-Cooled Reactors". Atomic Energy. 96 (6): 386–390. doi:10.1023/B:ATEN.0000041204.70134.20. ^ "Office of Nuclear Energy | Department of Energy" (PDF). Ne.doe.gov. Archived from the original (PDF) on 2013-01-13. Retrieved 2014-01-24. ^ "Dr. Charles Till | Nuclear Reaction | FRONTLINE". PBS. 2014-01-16. Retrieved 2014-01-24. ^ "ENERGY AND WATER DEVELOPMENT APPROPRIATIONS ACT OF 1995 (Senate - June 30, 1994)". 103rd Congressional Record. Library of Congress. Retrieved 16 December 2012. ^ "Ax Again Aimed at Argonne (Chicago Tribune - Feb 8, 1994)". Chicago Tribune. Retrieved 18 March 2015. Tom Blees (2008). Prescription For The Planet: The Painless Remedy for Our Energy & Environmental Crises. BookSurge Publishing. ISBN 978-1-4196-5582-1. U.S. Congress, Office of Technology Assessment (May 1994). Technical Options for the Advanced Liquid Metal Reactor (PDF). U.S. Government Printing Office. ISBN 978-1-4289-2068-2. Charles E. Till; Yoon Il Chang (2011). Plentiful Energy: The Story of the Integral Fast Reactor: The complex history of a simple reactor technology, with emphasis on its scientific bases for non-specialists. CreateSpace. ISBN 978-1-4663-8460-6.